Notes: DVD and Ultraviolet copies are included with this Blu-ray disc. This title is also available in a DVD only edition. Set in Los Angeles in the slight future, Her follows Theodor, a complex, soulful man who makes his living writing touching, personal letters for other people. Heartbroken after the end of a long relationship, he becomes intrigued with a new, advanced operating system, which promises to be an intuitive and unique entity in its own right. Upon initiating it, he is delighted to meet ‘Samantha,’ a bright, female voice who is insightful, sensitive and surprisingly funny. As her needs and desires grow, in tandem with his own, their friendship deepens into an eventual love for each other. In some hands, this could easily turn into a mere gimmick. However, this is a Spike Jonze film, and he has delivered something altogether different. He has done such a fine job that the Academy saw fit to honor the film with 5 Oscar nominations (Best Picture, Best Original Screenplay, Best Production Design, Best Original Score, and Best Original Song). Jonze took home the Oscar for the Best Original Screenplay, and managed to take home a Golden Globe Award in that same category. Joaquin Phoenix was cast as Theodor in the film and gives an incredibly layered performance. Phoenix actually had an incredible impact on the shape of the final film. Jonze would alter his script to fit Phoenix so that it was more natural for the actor to perform. Scarlett Johansson was eventually cast as the voice of Samantha, but the role was performed by another actress during the film’s production. “Originally, on set, we’d cast Samantha Morton as that character. So she was with us on set every day, and she was in [Joaquin Phoenix’s] ear, and he was in her ear. And she was in another room, and they were just speak-talking. And so a lot of what he did was listen to her. K.K. Barrett’s Oscar nominated production design on Her adds to the film’s overall feeling of isolation and loneliness. Her has enjoyed a mostly positive critical reception. Scott Foundas’ review in Variety is typical of the praise that the film has received. “…A truly 21st-century love story, Jonze’s fourth directorial feature (and first made from his own original screenplay) may not be Middle America’s idea of prime date-night viewing, but its funky, deeply romantic charms should click with the hip urban audiences who embraced Jonze’s earlier work, with some cross-pollination to the sci-fi/fantasy crowd. …And where so many sci-fi movies overburden us with elaborate explanations of the new world order, Her keeps things airy and porous, feathering in a few concrete details (a news report mentions an impending merger between India and China) while leaving much to the viewer’s imagination. Richard Corliss wrote an equally flattering review in Time magazine. 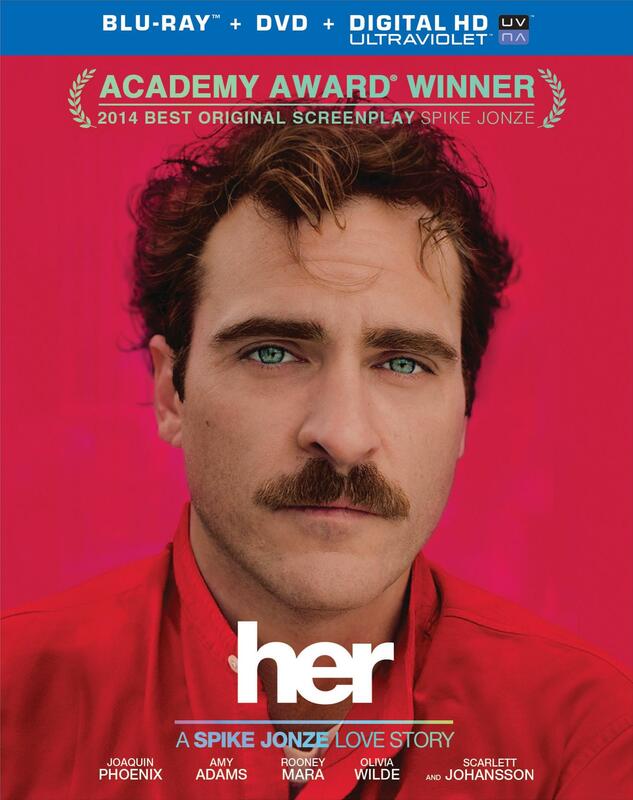 “…With his new movie Her, which has its world premiere tonight as the closing attraction at the New York Film Festival, Jonze creates the splendid anachronism of a movie romance that is laugh-and-cry and warm all over, totally sweet and utterly serious. Or, if you will, utterly Siri. For Theodore’s girlfriend is a computer voice named Samantha (Scarlett Johansson). She’s his ‘IT’ girl…This is a movie about the nicest, prettiest people, and the love and hurt they dish out and take. In a future Los Angeles so near-Utopian that no scene takes place in a car, the palette is gently muted — not broiling sun burning through corrosive smog but, as Jonze said at today’s press conference, ‘the colors of Jamba Juice.’ (Many of the city’s exteriors were shot in Shanghai.) The people in her take their behavioral cues from the color scheme. Theodore’s friend Amy (Amy Adams) her husband Charles (Chris Pratt), and his coworkers at BeautifulHandwrittenLetters are gentle, tender and affectionate, as if they had majored in the modulations of caring. Manohla Dargis joined the chorus and sang the film’s praises in the New York Times. Peter Travers went as far as saying that Scarlett Johansson’s performance was award-worthy in his review of the film for Rolling Stone. Rafer Guzman’s review also fell in line with the majority opinion. Todd McCarthy praised the film as well, but took a more cynical tone and seemed to have plenty of reservations about the film. His main problem seems to be the film’s length. Stephanie Zacharek was one of the few critics to write a negative review of the film. A close reading of her review betrays the fact that Zacharek interprets the themes in Her much differently than do most of the other critics. …There are many, many feelings stuck into Her, pin-cushion-style, but the result is a kind of overstuffed stupefaction. Jonze and Van Hoytema take great care with the visuals, working hard to hit notes of longing and mournfulness. At one point, a shot of airborne, sunlit dust motes transmutes into a field of falling snowflakes. How serene! How lovely! But what do dust motes have to do with snowflakes? Sometimes a technical trick can be too gorgeous, so pre-visualized that it comes off as a contrivance. Mick LaSalle was another critic that seemed to dislike the film, and his main problem seems to be the subject matter. It seems as if LaSalle took a philosophical dislike to the themes in the film. “What can be said for a movie that’s a lot more interesting to think about than watch? 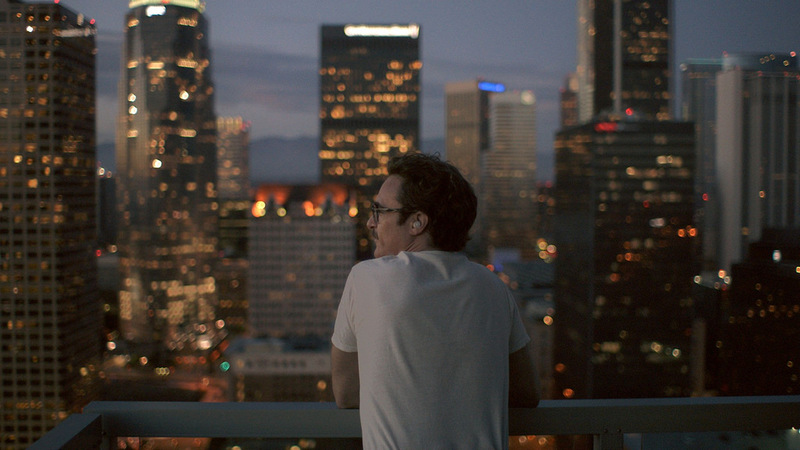 Her, the latest from director Spike Jonze, embellishes its clever premise – about a man who is in love with his operating system – with little touches of the unexpected. Yet the best things in the movie aren’t transporting or diverting but merely incite intellectual recognition: Yes. OK. That’s amusing. The story is too slender for its two-hour running time, and the pace is lugubrious, as though everyone in front and behind the camera were depressed. But the biggest obstacle is the protagonist (Joaquin Phoenix), who is almost without definition. He is just some average guy of the near future, totally bland, someone with no obstacle he needs to overcome and no powerful desire he needs to satisfy. As such, he is a storytelling problem, but he might be something more. Her is a rare film that is rich enough to be interpreted differently by different people. These differences might even be quite contradictory in nature. Where one person might find the themes optimistic, another might see them as overwhelmingly pessimistic. This is because Jonze is wise enough not to try to answer the questions that the film raises. He is content to simply ask them. Spike Jonze addressed this issue in an interview. “I think the other thing that’s been really exciting about it is that as I’ve talked to people, the variety of reactions for what the movie is about is wide. You know, like some people find it incredibly romantic, some people find it incredibly sad or melancholy, or some people find it creepy, some people find it hopeful. This statement perfectly sums up everything that is good about the film. If Her sounds like a film that would appeal to you, it probably will. The Blu-ray and DVD discs are held in the standard Blu-ray case with film related artwork. A slip sleeve with the same artwork slides over the case. The animated menu features film-related footage and is easy to navigate. The footage used looks like it might be a sort of deleted scene from the film. In any case, it makes for an attractive menu. Warner Brothers offers a wonderful 1080P AVC transfer that does not disappoint. The picture exhibits a stunning amount of detail and clarity at all times. Jonze’s unusual color palette for the film is consistently accurate and the transfer makes good use of contrast. There are no digital anomalies to mar the transfer either. Everything here is as it should be. This 5.1 DTS-HD Master Audio track is also quite impressive. The sound is quite immersive and spreads evenly and naturally across the speakers. The track is perhaps not as dynamic as one might expect from an action film, but it serves this film perfectly well. Dialogue is consistently intelligible (even as it is mumbled by Joaquin Phoenix), and is well prioritized. There is plenty of ‘behind the scenes’ footage here from the production of Her, but there isn’t any interview material (or commentary) to put the footage into context. It is certainly nice to have the footage included on this disc, but it would have been nicer if it was edited in a more digestible fashion. A proper ‘making of’ documentary would have been preferable. Various people are questioned about various aspects of love in the modern world. People expecting this to be a featurette about the film will be disappointed. At a little under four minutes in length, this feature was never going to amount to very much. One might describe this best as a kind of trailer with snippets of ‘behind the scenes’ footage, and snippets of the film that play over two long dialogue excerpts from the film. With his Oscar winning screenplay, Spike Jonze has created a film that begs to be seen at least once. It will probably be an essential purchase for many people. The exceptional image and sound transfers make this Blu-ray purchase an easy recommendation.